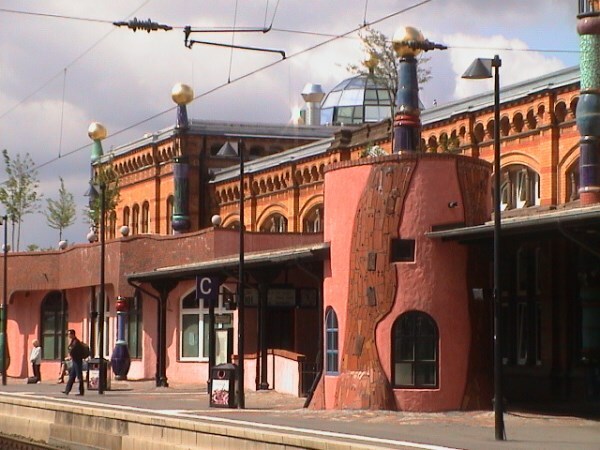 Viennese artist, Friedensreich Hundertwasser, has designed what has become one of the more unique and visually stimulating buildings in the world. With over 1000 unique windows, individualized handles on windows and doors, a living roof, café, parking garage, restaurant, bar, playground, and a running stream, the Waldspirale in Darmstadt, Germany is an architectural wonder. The most recent work from New York based designers Arakawa and Gin, Reversible Destiny Lofts is an unusual apartment block based in Mitaka, Tokyo. 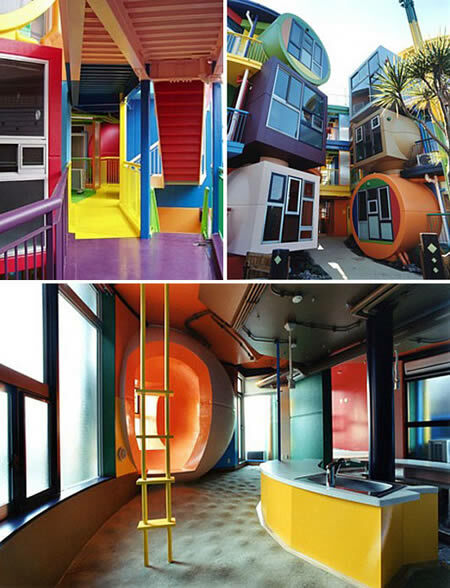 They are eye-catching brightly painted lofts that look like a McDonald's play ground through the eyes of someone on LSD. The architecture looks like the aftermath of a size 3 earthquake, a little shaken and lopsided. The price? US$750,000 each. 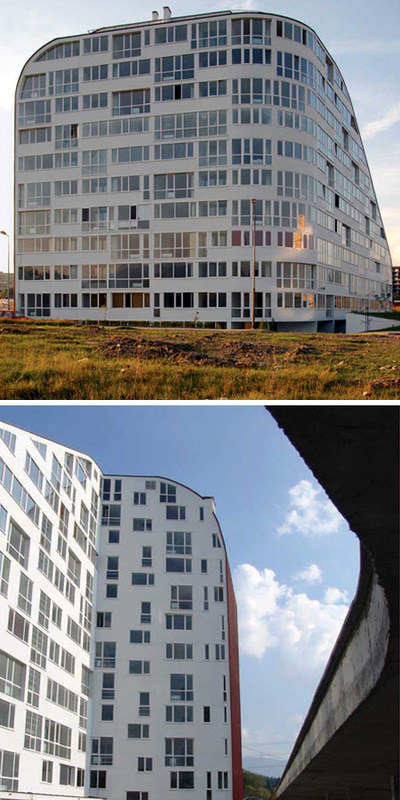 Block 16 is part of the master plan designed by OMA for a new prestigious city centre in Almere, Holland. 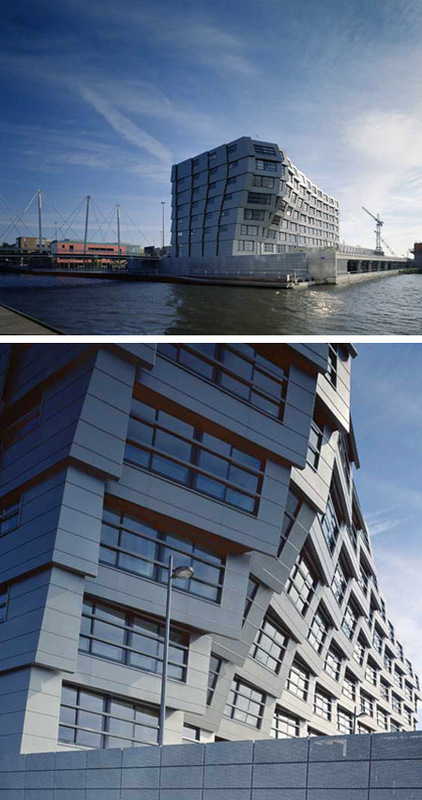 The autonomous expressive block reacts on two conditions: the billowing end marks as a kind of gatekeeper the harbour entrance. At the other end the movement is smoothened and the building fits in with the right-angled grid of the adjacent glass high-rise housing blocks. 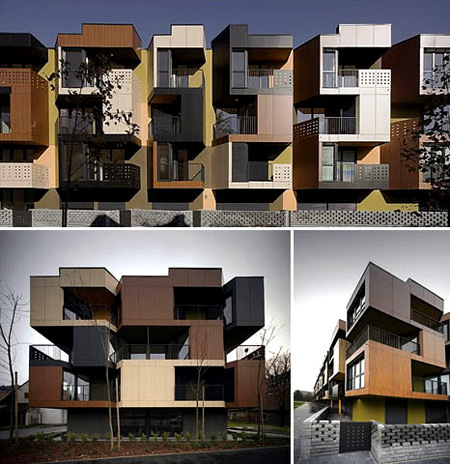 Slovenian architects Ofis recently completed this apartment block in the centre of Nova Gorica, Slovenia. 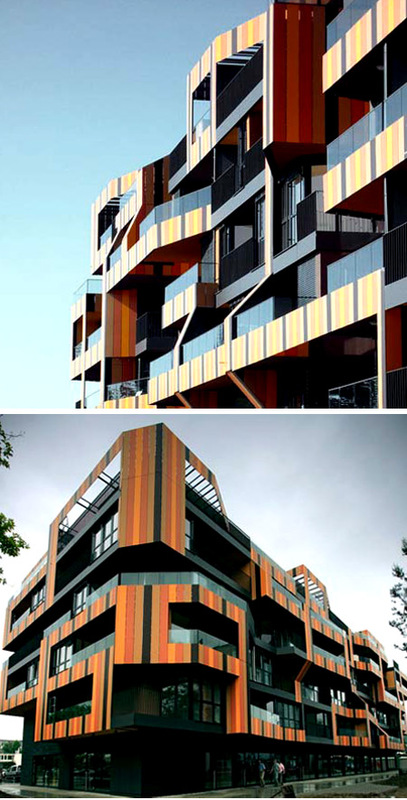 The facade is composed of a 3D “lace” pattern that generates elements such as balconies, terraces and pergolas. 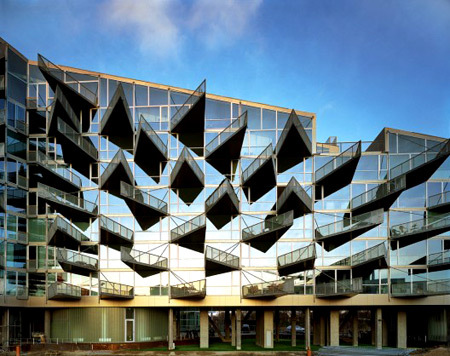 This building in Copenhagen, Denmark is an apartment block made up of V and M shapes. The idea is that the blocks are formed as such to allow for daylight, privacy and views. Liulin Apartment Building, in Sofia, Bulgaria. Tetris apartments in Ljubljana. Since the orientation of the building is towards the busy highway, the apartment opening together with balconies are shifted as 30 degrees window-wings towards the quieter and south orientated side. Each apartment has view towards its own balcony, sometimes there is also a glazed loggia. The final secular design of the Spanish surrealist Antoni Gaudí, Casa Milà Barcelona is an apartment building with a fanciful aura. Wavy walls made of rough-chipped stone suggest fossilized ocean waves. Doors and windows look like they are dug out of sand. A comical array of chimney stacks dances across the roof. 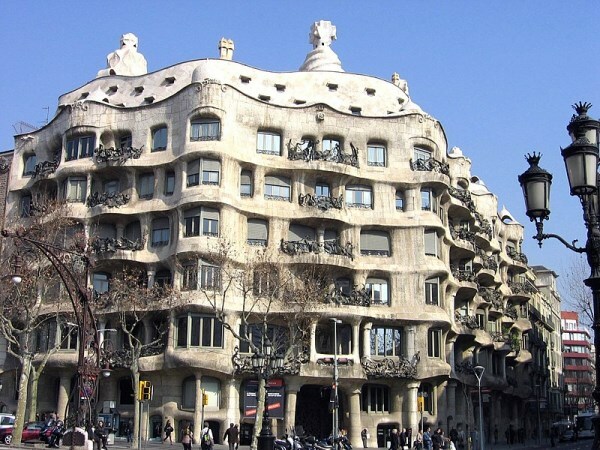 This unique building is widely but unofficially known as La Pedrera (the Quarry). In 1984, UNESCO classified Casa Milà as a World Heritage site. Today, it is used mostly for cultural expositions. 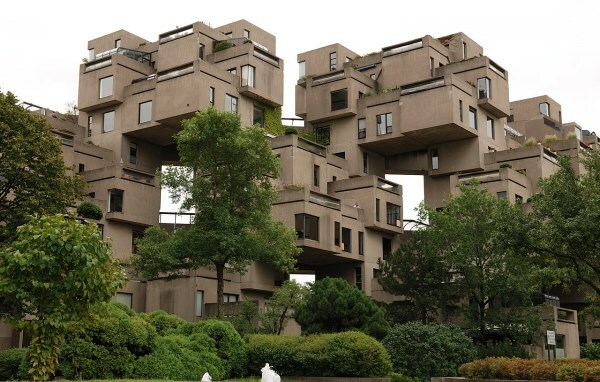 Apartments connect and stack like Lego blocks in Montreal's Habitat 67. Without a traditional vertical construction, the apartments have the open space that most urban residences lack, including a separate patio for each apartment. 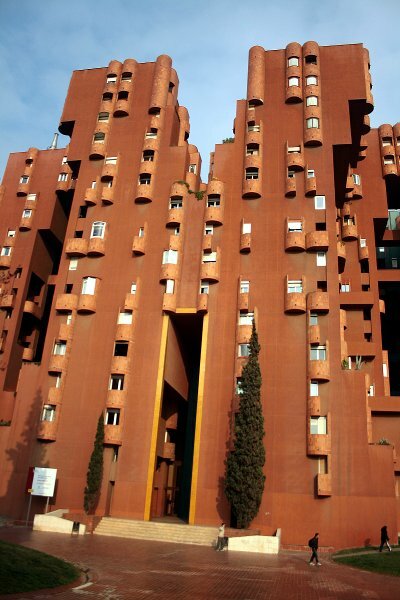 Walden 7 'city in space' apartment block in Barcelona, Spain.